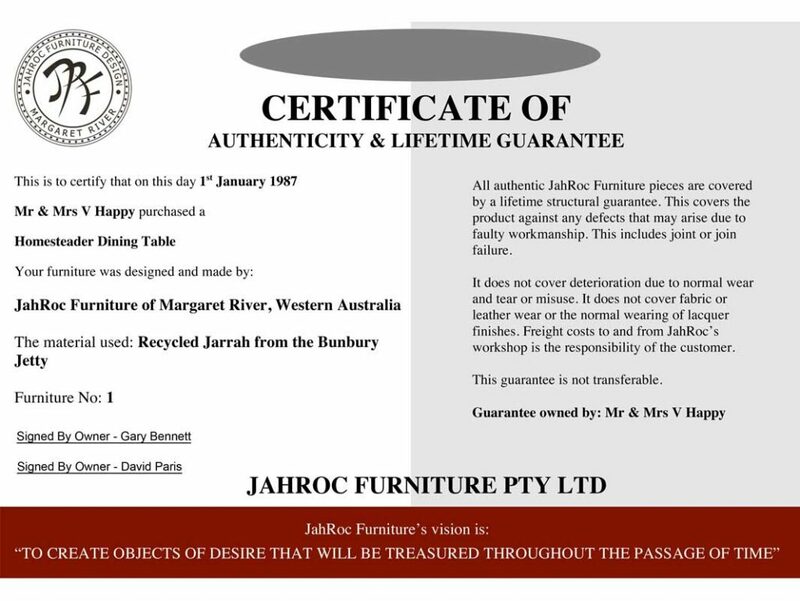 JahRoc Furniture | Est 1987 | Made in Margaret River, Western Australia. Designed and made by Master Craftsmen Gary Bennett and David Paris. These 8 points explain why JahRoc’s customers are so confident to purchase their bespoke fine furniture from JahRoc Furniture. JahRoc are industry leaders in design, and their unique creations have won many awards including “Best of the Best” in Australia. 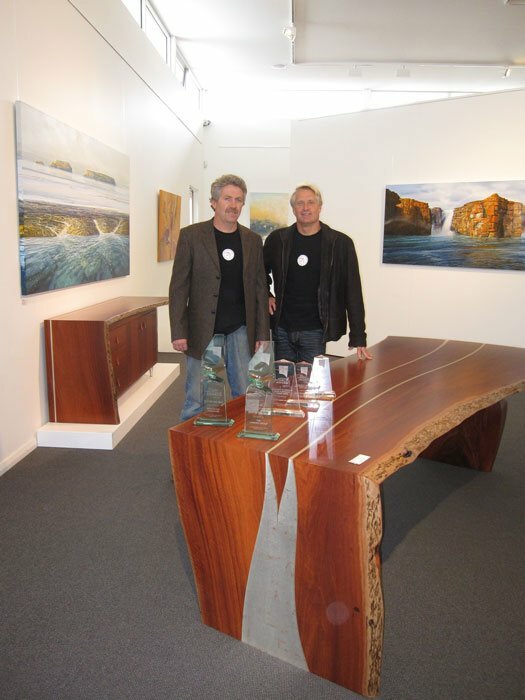 On average JahRoc Furniture have won two awards per year since commencing business. What this means to you is that you will own furniture that is not only unique but the designs have been recognised by industry peers to be at the very cutting edge of Australian design. This will add an edge to your home that will set you apart from the crowd. You will live with the joy that only great design can bring you. JahRoc Furniture is the only Australian company in the furniture industry that has the absolute confidence in their workmanship that they provide the owner with a Lifetime Structural Guarantee. Yes that is right – even for their dining chairs which is unheard of! 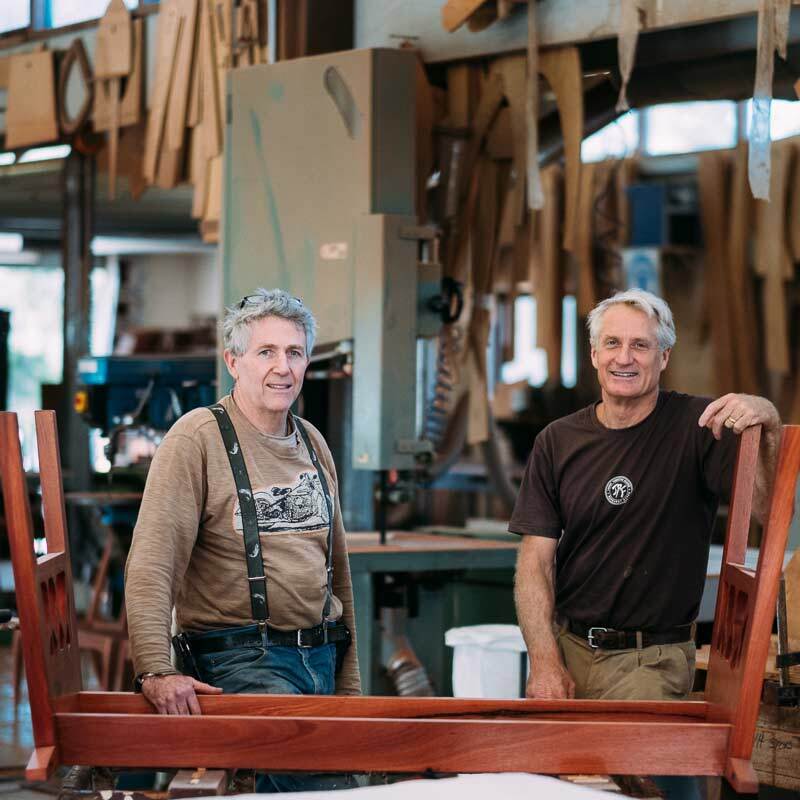 Their furniture is destined to become family heirlooms for generations to come. What this means to you is that when you invest in JahRoc Furniture you are certain to enjoy many, many years of pleasure from it. Every piece displays master workmanship which you will be proud to own and to pass on to your family. JahRoc’s hand built furniture stands up to the Lifetime Structural Guarantee they give to the purchaser. JahRoc’s craftsmen take pride in their workmanship and have the utmost integrity by using only the best glues and polish, along with joinery methods that have been practiced for centuries. This means you can be confident your JahRoc Furniture will not only look amazing in your home, it will withstand many years of use by you, your family, friends and guests for now, and as an heirloom for generations to come. JahRoc Furniture has been recycling beautiful and rare Australian timbers for over 30 years. They see it as their responsibility to be as gentle as possible on our environment. When purchasing from JahRoc you can be assured they take great care to leave the environment in tact by sourcing timber that is salvaged from the forest floor, or recycled from old buildings or bridges such as the Bunbury Jetty, Cottesloe Flour Mill and Greenhills Railway Bridge. This means that by purchasing JahRoc Furniture you are also helping protect our planet. If for some unknown reason you wish to sell your JahRoc Furniture in years to come, you can be assured you will fetch a good price for it. It is well know that the JahRoc Furniture brand equals exceptional quality, and this will go a long way in the re-sale of your furniture. This strengthens their claim of investment quality, knowing that JahRoc Furniture will continue to increase in value from the day you bought it. What this means to you is that you will get a good price for your furniture if you feel the need to sell it, and you will also have peace of mind knowing that your furniture is appreciating in value while you are enjoying using it. JahRoc is a team dedicated to serving their customers. Nothing is ever too much trouble and all the testimonials attest to this. The attention and service you receive from JahRoc does not stop at point of sale, but is an open-ended commitment for the lifetime of your furniture. If on the odd occasion a problem does occur we will attend to it as a matter of urgency. Gary Bennett founded JahRoc Furniture in 1987 and soon after took on a partner in business, David Paris. Both are actively on the tools and hand make all of the furniture orders, together with one full time furniture maker, Jagath Prasantha and one apprentice, Luka Burke. Every piece of JahRoc Furniture is made in Margaret River, Western Australia. Wives Lara Bennett and Joanne Paris run the sales side of things, JahRoc Galleries, and are in there 6 days a week, with Sundays taken care of by another sales professional. JahRoc is a small family business, made by the owners and run by the owners, which means when you ring or visit the gallery you are most likely going to be talking to one of the owners. JahRoc do what they say they will do, without exception. They strive to produce the highest quality in all areas. Their integrity stems from providing you with the finest quality furniture backed with a written lifetime structural guarantee. If for any reason you are not totally happy with the furniture that JahRoc have created for you then they will help you in every way possible to achieve your complete satisfaction. GUARANTEED!